All templates offered on this page are table website templates. The first two ones only differ in colour. As neutral buttons are included in the set you can add as many links to the navigation bar on the left side as you like. 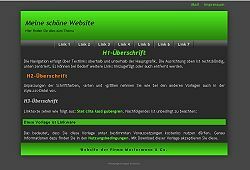 The third website template has buttons with text links which avoids the use of a graphics programme. The fourth website template has a horizontal navigation bar. With a little routine it can be extended with the neutral buttons which are included in the set. W3C-compliant website template with 2 horizontal navigation bars above and below the header. Both use text links. You don't need to use a graphics program for the texts. Same template like above only in different colours.